I got this information through e-mail from Airtel. According to this e-mail, now you can double your broadband browsing speed by just paying Rs 100/- extra over the current tariff plan. With this you'll also get Rs 100/- worth calling value, making it an awesome deal! Here is the image from advertisement. 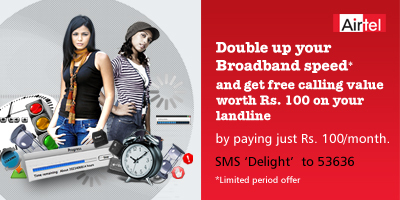 To activate this offer on your broadband just send a SMS DELIGHT to 53636 from your mobile number registered with Airtel or Otherwise you can fill-up your broadband details in this web page to activate this offer. As per the customer care, activation should take at-most 96 Hrs and it should double up both day and night time surfing speeds! Wait for few more days to know my results. Update: This offer is not available for variable speed plan customers like me. In variable speed plan your surfing speed is changes during morning & the night time. Did the plan got activated for you ?